On 20th December a High Court Judge has ordered the Council not to take any steps to demolish the 1886 Dalston Theatre and Georgian & Victorian houses at 4-14 Dalston Lane London E8 until the Court has considered all the evidence and heard argument at a full-day hearing to be fixed for next year. On 24th November Hackney Council posted a demolition notice on the 1886 Dalston Theatre and 1820’s “locally listed” Georgian buildings. The Notice states that the Council intends to demolish the buildings in “early 2006” and that its Property Services have applied to its Planning Department to determine whether their prior approval is required as to the method of demolition. The Planning Department has until 21 December to respond to the application, after which Property Services could have proceeded with the demolition unless restrained by a Court order. The environmental & community action company, OPEN (Organisation for Promotion of Environmental Needs Limited) issued a judicial review application in the High Court which included an injunction application to restrain Hackney Council from proceeding to demolish the buildings. OPEN’s claims that the Council can not lawfully demolish the buildings without first making a full planning application which requires public consultation. OPEN raises four main claims. First that the Council does not have permitted development rights to demolish the buildings without a full planning application. The Georgian houses and the Theatre are dwellings or adjoin dwellings and they have been made unsafe or uninhabitable due to the Council’s and/or its Lessees conduct, and so the exception to a landowner’s demolition rights applies here. Hackney Council have owned the buildings’ freeholds since 1977. Second that the buildings have been acquired at public expense and the public landowner, Hackney Council, must reach its decision only after full and proper consideration. Third that where, as in this case, a Council is still consulting the public on a local Area Action Plan, it can not predetermine the outcome by demolishing buildings on a strategic site within the area before the Plan is finally adopted. Fourth that where some of the buildings affected are “locally listed” by the Council it can not contravene its policy to “retain and enhance” such buildings by demolishing them without due formality. 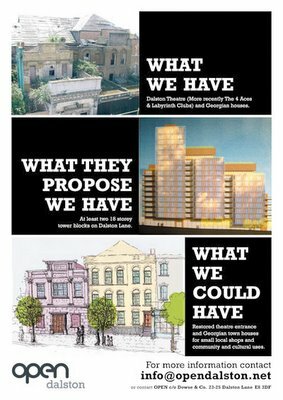 Hackney Council originally fast-tracked its plans by posting a site notice on 3rd October to demolish the historic Dalston Theatre and the adjoining terrace of Georgian houses on Dalston Lane by the end of November, ignoring local demand to have these buildings saved and restored for community use. A rapidly growing local campaign, instigated by Dalston based not-for-profit organisation OPEN, is committed to engaging local residents in challenging this demolition and the Council’s proposals for towerblock developments and is demanding a genuinely transparent consultation process on the best way to develop the site. Dalston Theatre has stood for almost 120 years, successfully reinventing itself over the decades to meet the changing needs and tastes of the people of Dalston. The iconic building has played host to regular capacity crowds of three thousand as an important circus, theatre, and cinema, latterly playing a hugely influential role in the development of both the burgeoning reggae scene in the 1970s, as legendary music venue the Club Four Aces and the rave scene of the 1990s, as seminal drum & bass and acid house club, Labyrinth. OPEN maintains that the recent history of the site has been one of scandalous landlord neglect. In 1997 Hackney Council served compulsory purchase notices to obtain vacant possession of the Theatre from its tenants. One month later the building’s roof slates were stripped and sold from the site. Since then, rain has largely destroyed the magnificent Art Deco interiors; hence English Heritage’s reservations about listing the Theatre. OPEN has now asked the Department for Culture, Media and Sport to review that decision, which OPEN claim was based on incorrect information provided by Hackney Council. The DCMS’s views are still awaited. Since 1998 Hackney Council has let the Theatre and adjoining houses fall into a semi-derelict state. A Council spokeswoman has sought to justify demolition by raising police concerns about asbestos, squatters and drug users and by stating that the buildings are structurallu unsound The Council surveyor who guided OPEN’s inspection of the buildings in August 2005 was unable to show evidence of any of the above. The only squatters associated with the buildings, but recently evicted, were those who have been keeping one of the domestic buildings wind and watertight since it was abandoned by the Council in 1999. The heritage buildings stand on the northern part of a 2.2 acre site owned by the Council. Neigbouring it is the 2 acre site of the old Dalston Junction railway station owned by Transport for London The planned extension of the East London Line (with works to commence July 2006 and due to open in 2010), combined with the backdrop of the 2012 Olympics, has transformed the Council-owned site into prime development land. After a decade of neglect Council demolition plans are now proceeding without any imaginative consideration of alternative uses for the historic buildings already on the site, or of public opinion regarding the buildings and whether they should be restored and retained. TfL have confirmed that their station development can proceed whether or not the Theatre and adjoining houses are demolished or not. In July 2005 Hackney Council’s Cabinet approved a planning brief for the area, which acknowledged the community’s wish to retain its heritage buildings. The Council’s Dalston Area Action Plan, which claims to want the involvement of local residents in the shaping the area’s future, included an option to retain these buildings. However this Plan will not be concluded and approved for many moths, long after the planned destruction of the heritage buildings. The site scheduled for demolition includes a pair of 1820's Georgian houses which are locally listed and thought to be the earliest surviving buildings constructed on Dalston Lane. The Theatre entrance was recently described by English Heritage as an "attractive and architecturally distinctive frontage… altogether absolutely delightful.” The buildings stand on land safeguarded for the future Crossrail2 (Chelsea/Hackney tube) development and therefore the redevelopment potential of the building’s site is complex and limited. Yet the planned wholesale demolition of the remarkable existing buildings suggests that this historically, socially and culturally important site could now be condemned to becoming part of yet another identikit, dense development of between10 & 18 storey towerblock flats and shops that places quick profit above investment in quality architecture, social housing and community facilities. OPEN energetically supports modern architecture and redevelopment in Dalston provided it meets the current and future needs of the existing diverse residential and business community. The Theatre site has been neglected for far too long and is at the heart of Dalston Town Centre. As a company formed by local residents concerned with the future of Dalston, OPEN also welcomes the arrival of the long awaited extension to the East London Line - uncertainty over this transport link has been a cause of planning blight in the area for over 20 years. Transport for London has confirmed that the East London Line Extension does not require the demolition of the Dalston Theatre site. In line with government policy, OPEN believes that, far from being a barrier to development, historic buildings have provided the foundation for the regeneration of many towns and cities. However, it appears that these principles are not being applied in Dalston. A local consortium of private investors and arts organisations is willing to consider refurbishing the Theatre and adjoining buildings to create a cultural centre for the visual and performing arts with additional community, entertainment and commercial uses. This option cannot be explored whilst the threat of demolition hangs over the site. OPEN is extremely concerned that the Council is not following its own planning guidelines, with regard to public consultation. Over the next few years people who live or work in the Dalston area will be affected by changes to our surroundings which will have a profound impact for decades to come. You can help ensure that these changes reflect your needs and aspirations. Much of the property surrounding Dalston Junction has changed hands in the recent past, and more is about to. Many of the historic buildings and businesses which give the area its special character are now under immediate threat. There have been numerous planning applications for demolition and re-development. Some have been rejected while others have been granted and building work is proceeding. Several sites have been left derelict and apparently abandoned and six major fires have contributed to an atmosphere of terminal neglect. At the request of local people we have formed OPEN (Organisation for Promotion of Environmental Needs Limited). It is a not-for-profit company that acts as a forum to exchange views and information. It voices and acts on the concerns of residents and businesses to positively shape the future of the area. • to promote excellence in the quality of existing and proposed buildings, public transport facilities and other amenities. • We want to stop the imminent demolition by Hackney Council of the historic buildings at 4-14 Dalston Lane, including the Dalston Theatre (also known as The Four Aces). OPEN is campaigning for public consultation on ways to incorporate these buildings into any new developments. We also aim to ensure that the Council's 'master-plan' for the entire site is of high quality and reflects what local people need and want. • OPEN welcomes the announcement that the tube extension to Dalston Junction (East London Line Extension) is now guaranteed. We are now campaigning to ensure that the Transport for London (TfL) building development plans on this site meet the needs and aspirations of people who live and work in and around Dalston. • The Dalston Area Action Plan is currently being prepared by Hackney Council. It will shape all major new building developments and have a massive impact on the environment in Dalston for decades to come. OPEN will continue to ensure that local people are made aware of these plans and that their needs are reflected in any final policy. If you care about Dalston and share OPEN’s aims, please become an Associate Member of OPEN and participate in the OPEN Dalston campaign. Email info@opendalston.net for more details. Members receive regular news about what is going on with plans for Dalston and can become actively involved through meetings and other events and by contributing to written submissions. A public meeting is being called for Thursday 15th December between 7.30pm and 9.30pm at St Michaels Hall, on the corner of Lansdowne Drive and Lavender Grove, E8. WHAT DO YOU THINK OF HOW BROADWAY MARKET IS CHANGING? WHAT DO YOU THINK ABOUT THE DEVELOPERS WHO NOW HAVE A LARGE STAKE IN THE AREA? WHAT DO YOU THINK ABOUT THE WAY HACKNEY COUNCIL IS MANAGING `REGENERATION' HERE, AND IN THE REST OF THE BOROUGH? The event is to be chaired by Rev William Campbell-Taylor. Each party will have 2-3 minutes to speak on one or all of the issues and questions will be taken from the audience. The media is expected to attend.